Wow, it’s certainly rush hour in the garden! My Marie Pavie rose just couldn’t wait to pop a bud even as new red leaves unfurled. 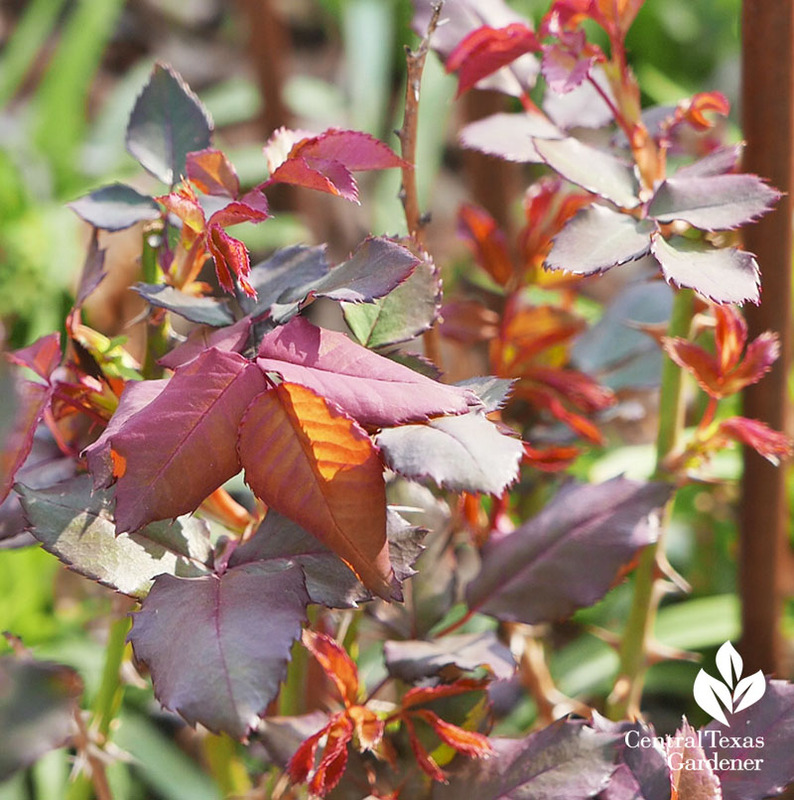 Every spring, anxious gardeners email to ask if those red leaves mean trouble. Actually, it’s natural. 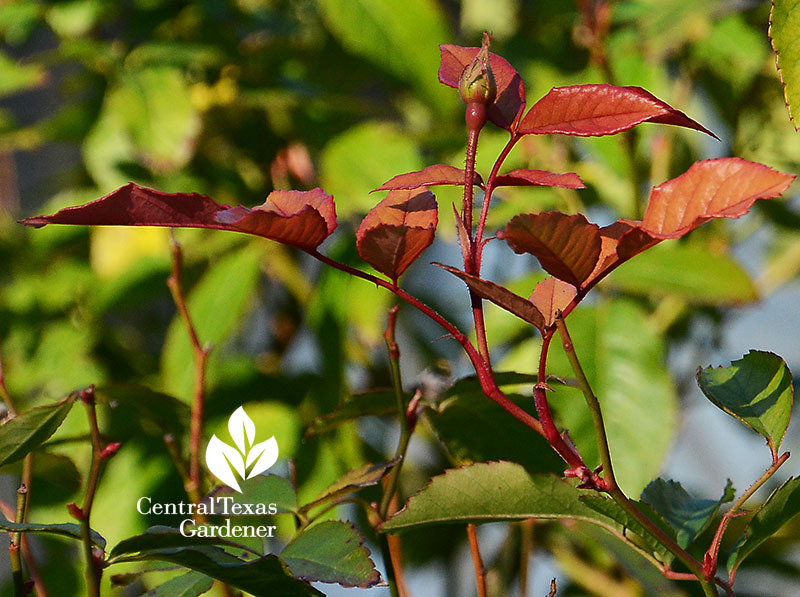 Daphne explains that many plants contain anthocyanins—a reddish hue—along with green-pigment chlorophyll. 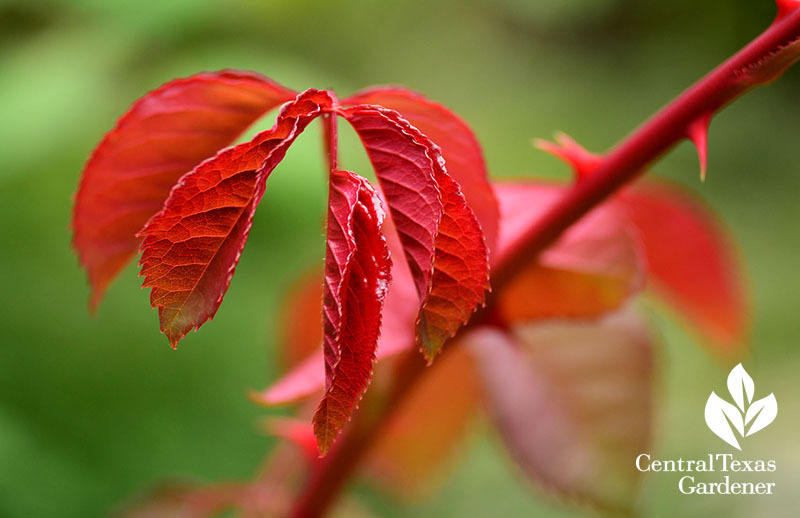 When new leaves emerge, chlorophyll levels are lower, so the red colors are more visible. As leaves mature, the green color dominates. 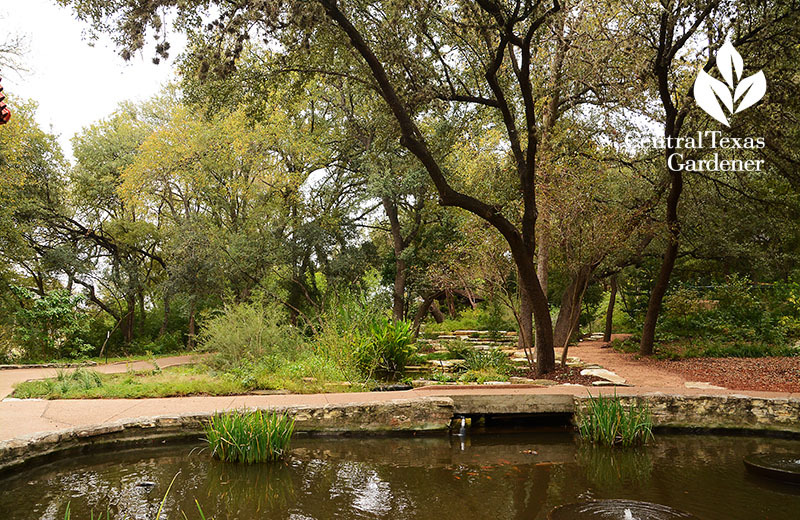 Since leaves don’t absorb green light, it reflects back green to our eyes. 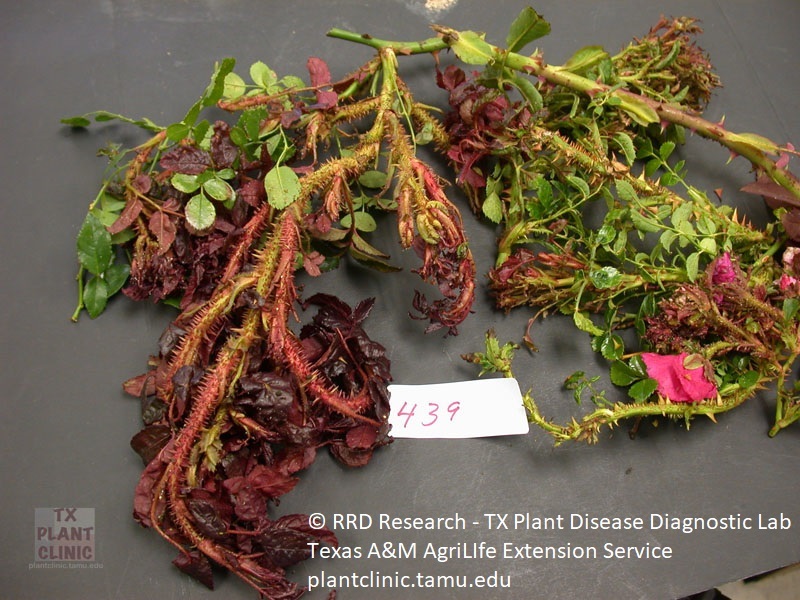 Distorted and contorted red leaves mean fatal rose rosette disease and the plant should be discarded in the trash can. Watch now! 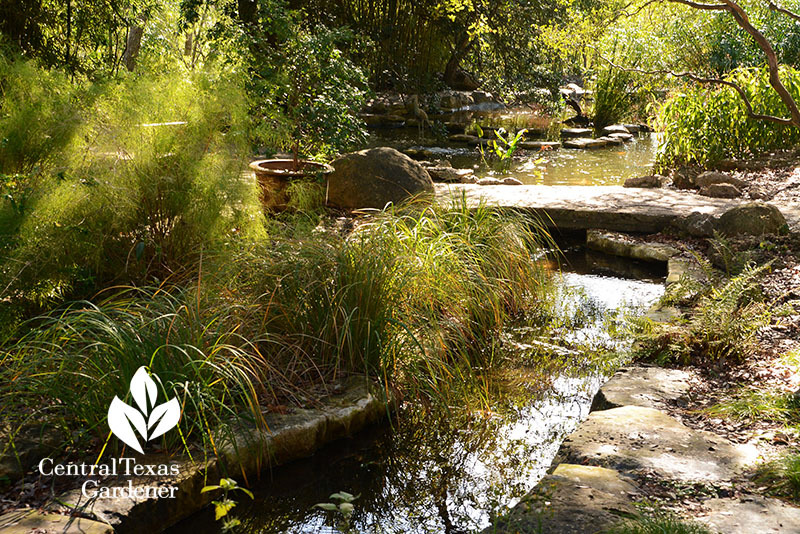 So, what’s the secret behind the proverbial green thumb? Science. 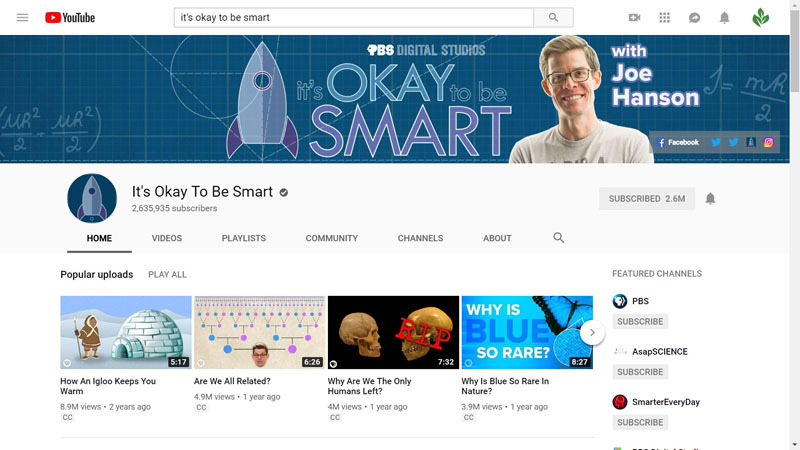 Ph.D biologist and science writer Joe Hanson, the creative force behind PBS Digital Studios’ online-first, innovative, intelligent, and lively It’s Okay to Be Smart, taps into your curiosity with science-based explanations. 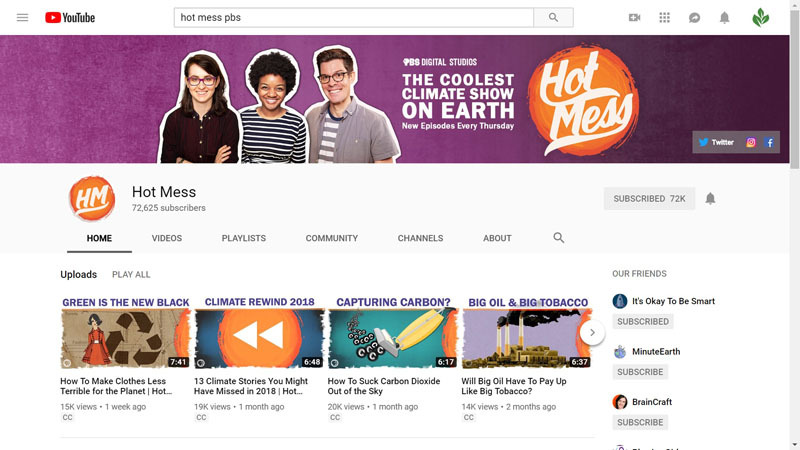 In 2018, he launched Hot Mess with fellow hosts Miriam Nielsen and Talia Buford to unravel the factors behind climate change. I promise that you’ll binge watch each and every one on YouTube! 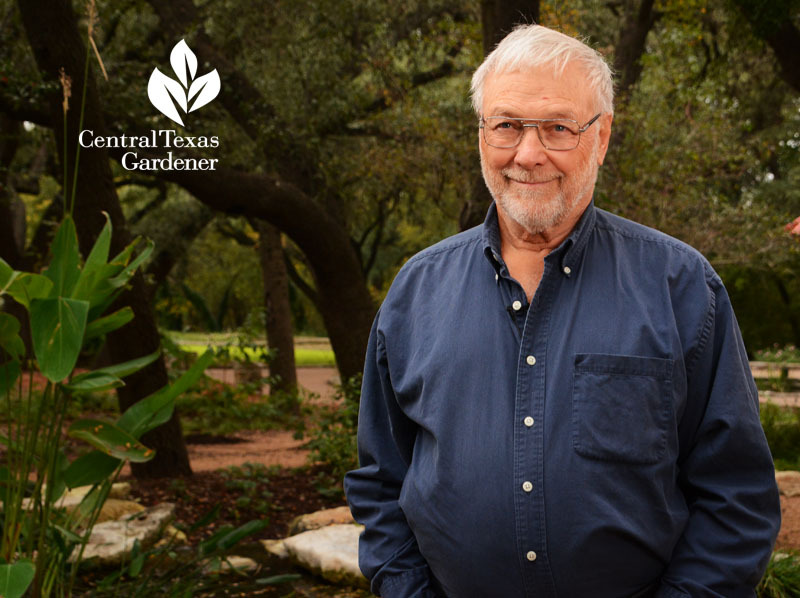 This week, meet Joe himself and get the story behind the guy who’s always curious to understand the science in our daily experiences, including plants and insects. Watch now! 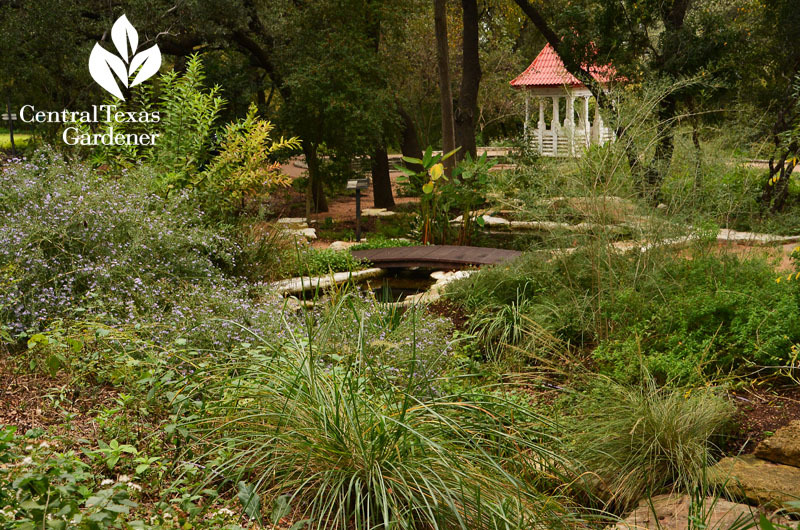 Even though plants are pepping up, it’s still winter, so hold off on fertilizer if you know you really need it. We can add compost now, of course, since that improves soil health. As we move into warmer weather, liquid products sometimes encourage foliar feeding. 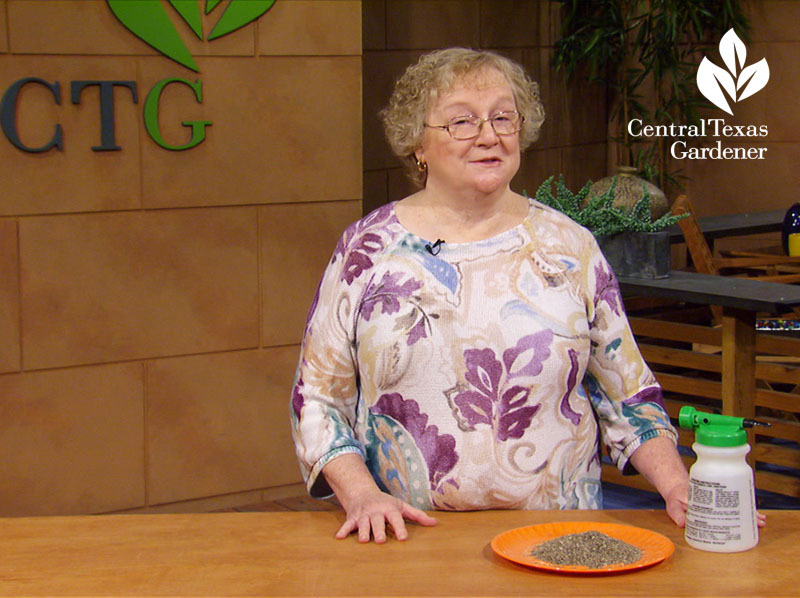 Herb n’ Cowgirl Ann McCormick analyzes why foliar feeding doesn’t help your plants as much as root applications, whether liquid or granular. Watch now! 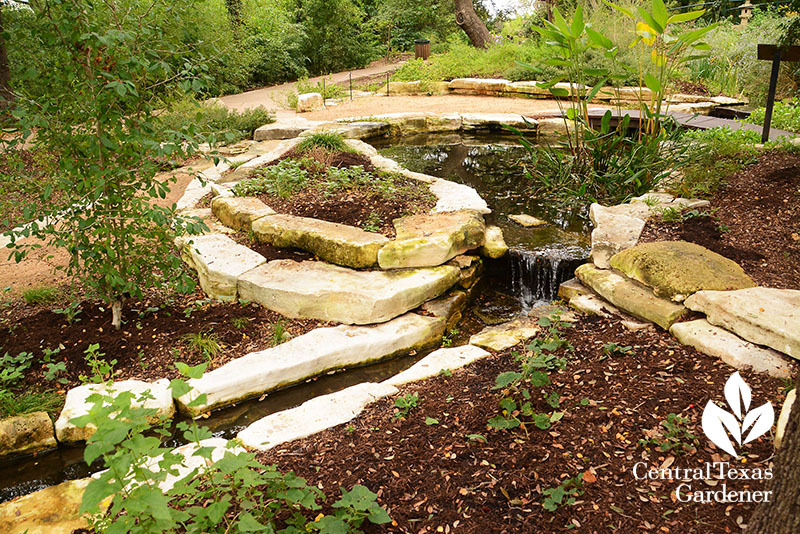 On tour at Zilker Botanical Garden, designer David Mahler of Environmental Survey Consulting and architect Evan Taniguchi created a new riparian garden that illustrates how to grow native plants in shade, along streambeds, and in ponds. 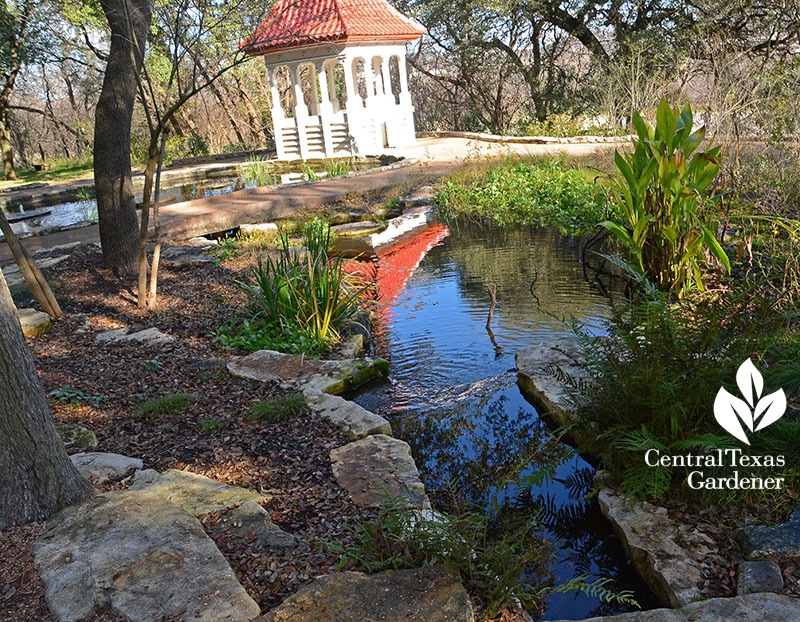 I discovered Zilker Botanical in college when serene walks, flowers I’d never seen before, and sweet, gentle spaces got my nose out of the books for an hour or two. 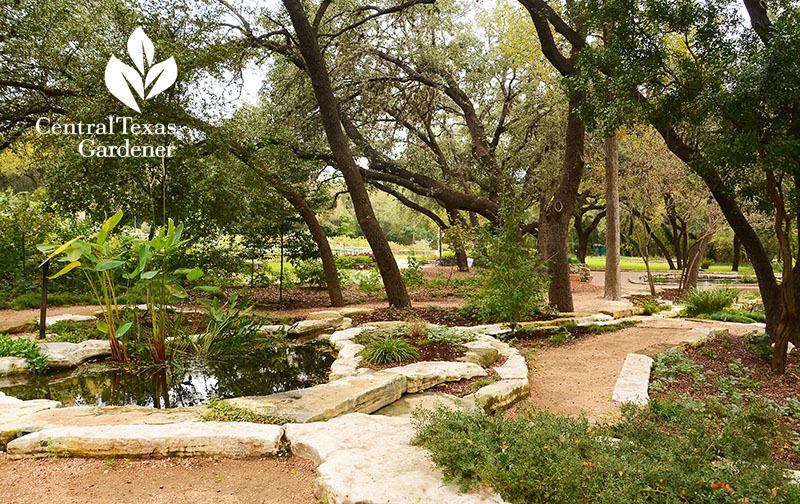 Later, I met many of the devoted gardeners in the Austin Area Garden Council’s diverse clubs, who taught me so much and peppered my first (and later) garden with tried-and-true plants at their shows and sales. 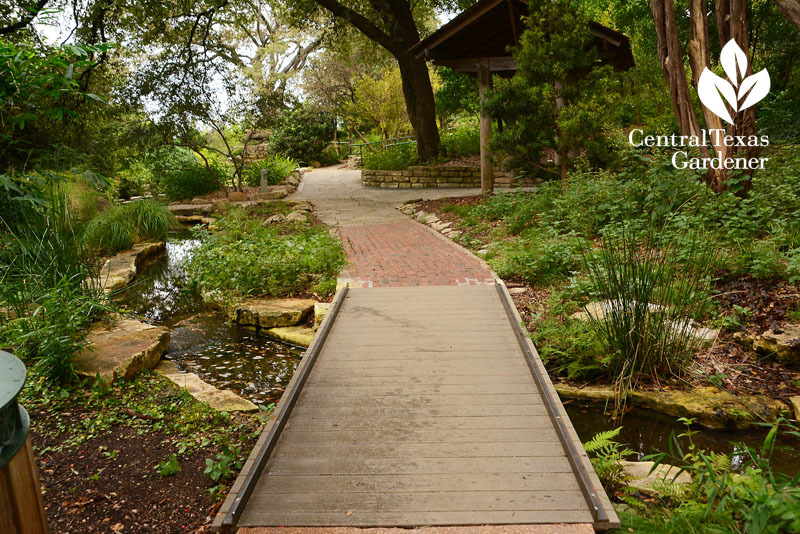 I also learned by visiting every season to understand the cycle of plants. 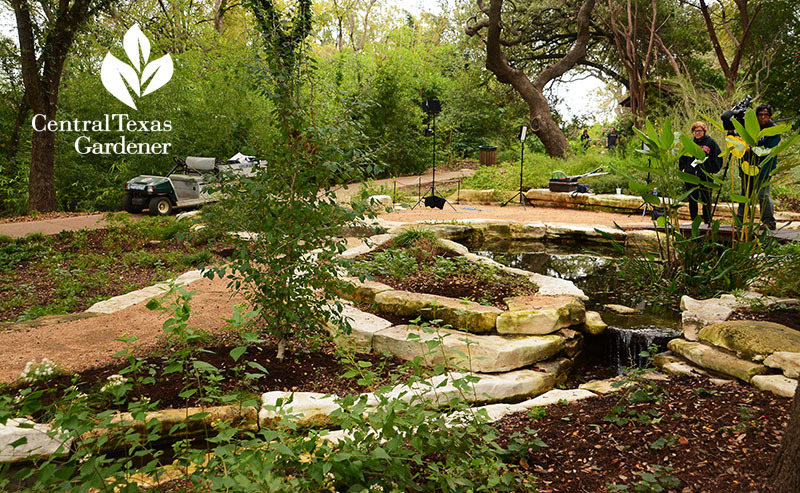 Volunteers have been instrumental in garden development and cultivation. 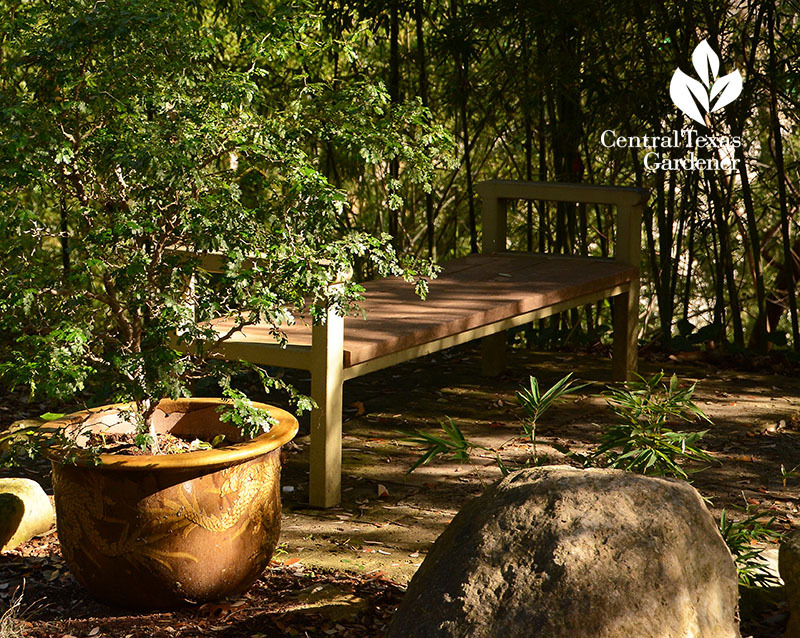 Since 1969, the Taniguchi Japanese Garden’s been a beloved destination, a laborious gift from a former California farmer, Isamu Taniguchi, who’d been interned in WW11. 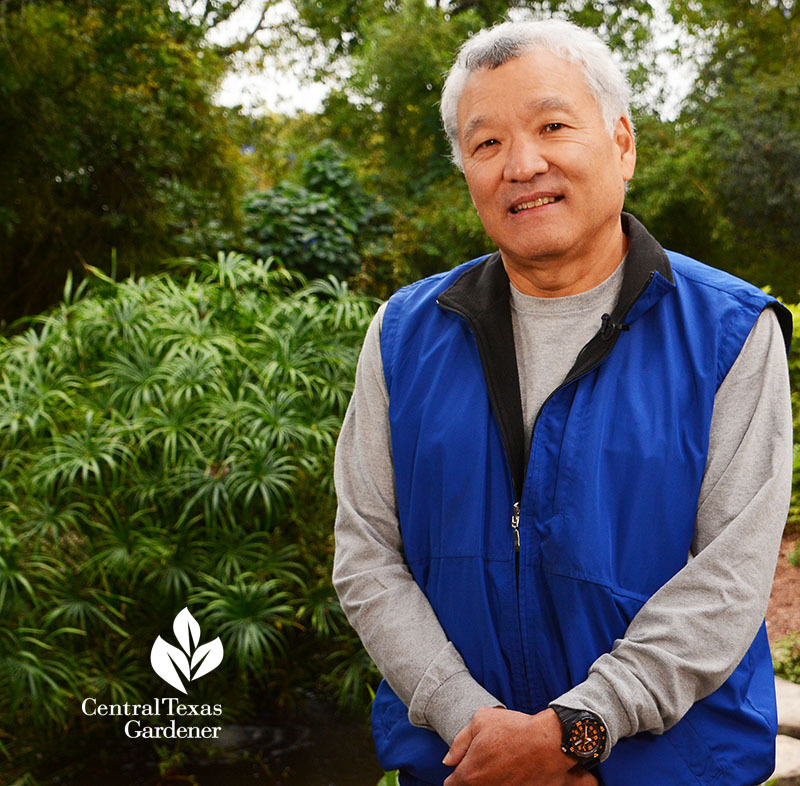 His grandson, architect Evan Taniguchi, tells his grandpa’s story and why he wanted to continue that mission by becoming part of the Zilker Botanical Garden Conservancy in 2015. 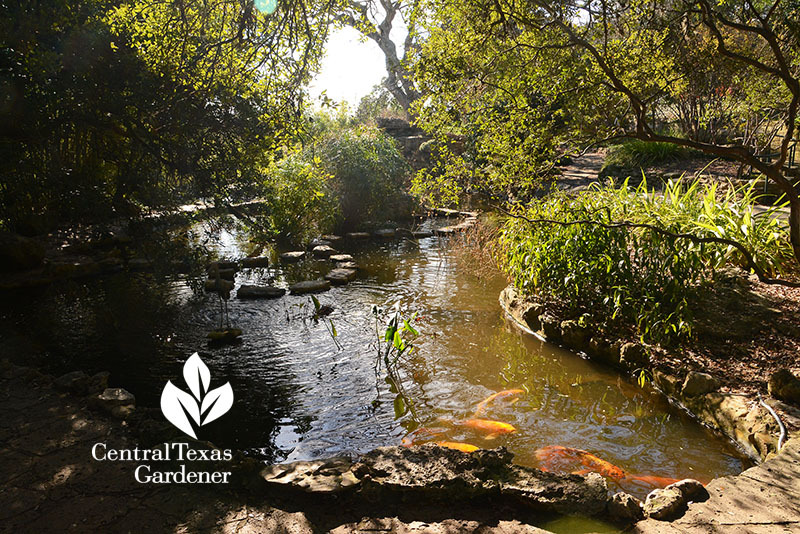 One project was to connect the Taniguchi Japanese Garden to the pond by the Rose Garden, then a less-than-lovely spot. Evan provided the complicated technical rendition. He’d known designer David Mahler of Environmental Survey Consulting possibly as long as I have! 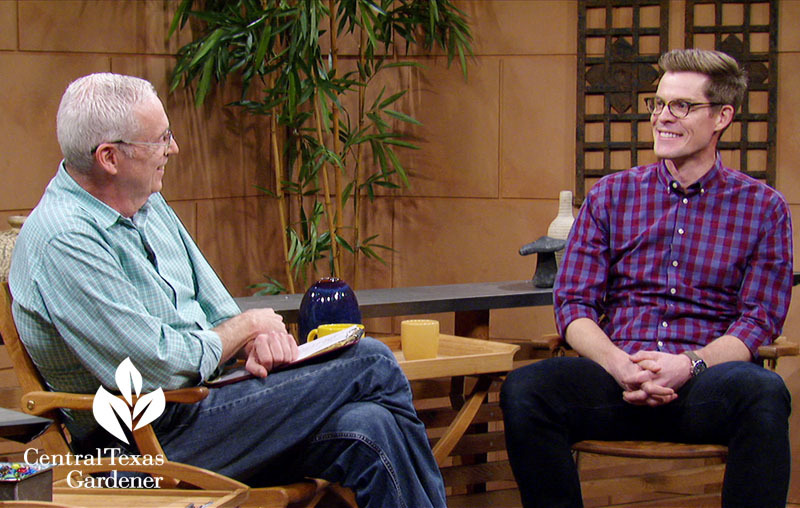 David’s been a life-changing force for me since I first met him on CTG. 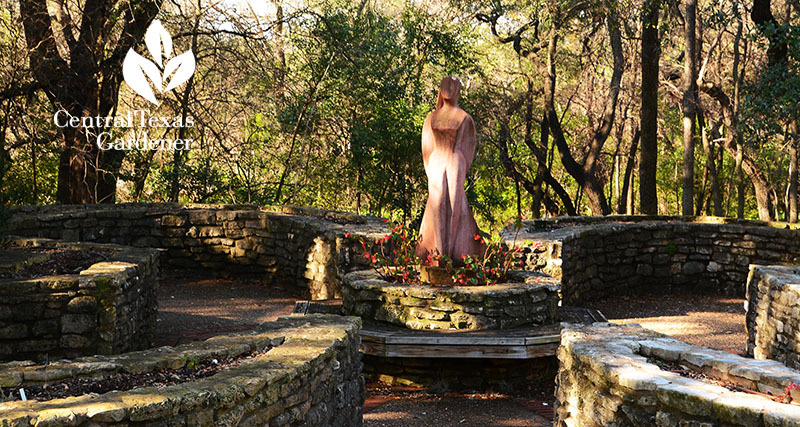 When he arrived in Austin, he found inspiration both at Zilker and the streams, waterfalls, and native plants of the Hill Country. 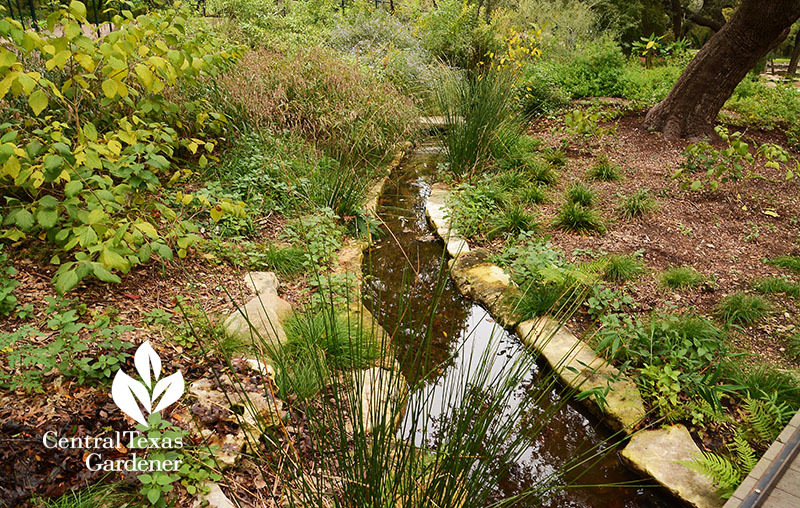 In 2017, David’s team began work to demonstrate how to use native plants in landscaping, particularly riparian plants (stream edge plants) and in ponds. 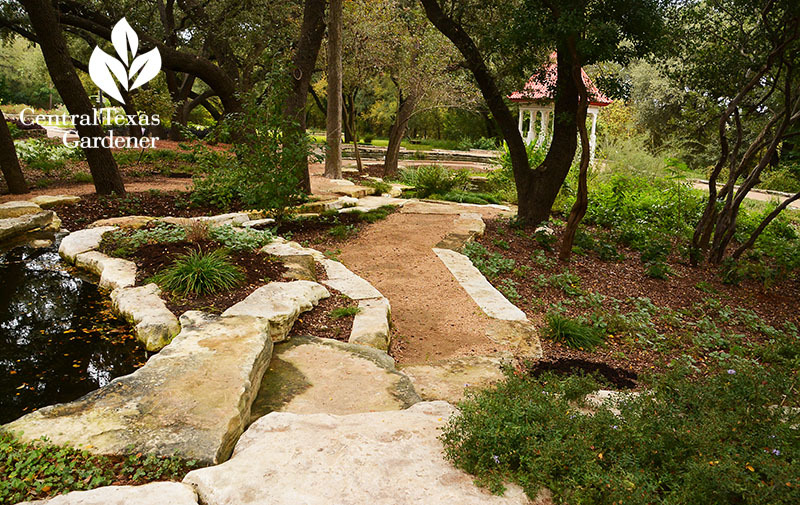 They jackhammered out rock and concrete to build five concrete shells connected by pipes along a 160’ stream. 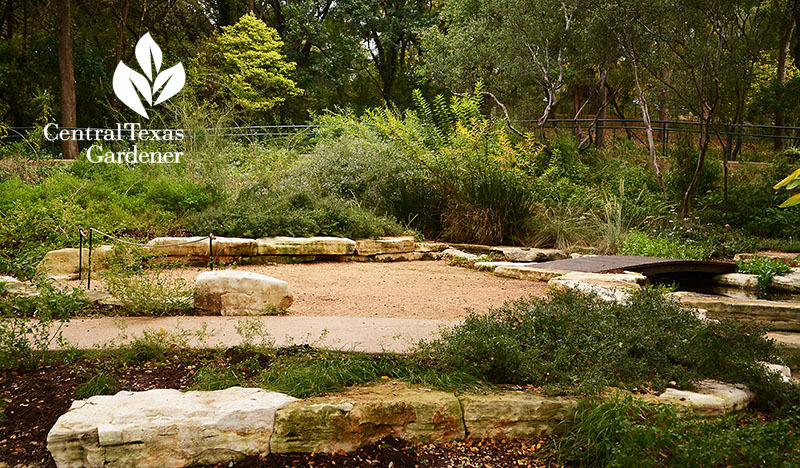 Raised beds provide seating and niches for native plants, including sedges, ferns, and flowering perennials. 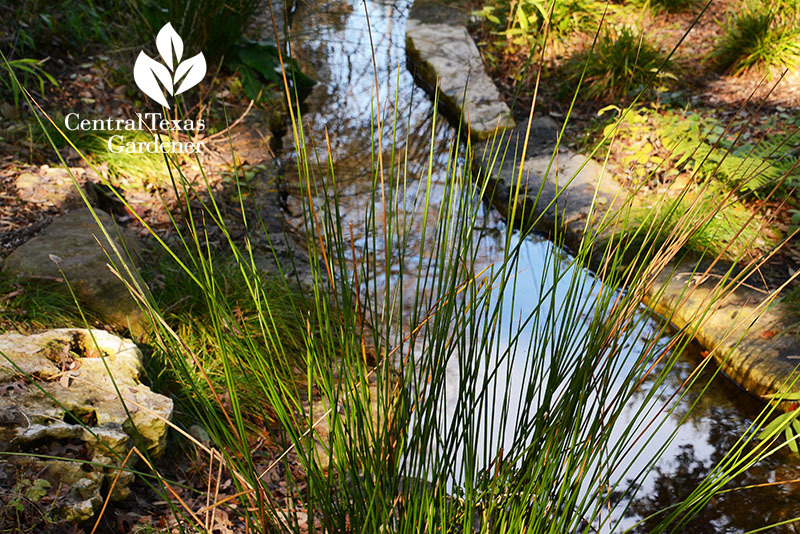 Native juncus contributes a narrow, tidy grassy form along the streams. 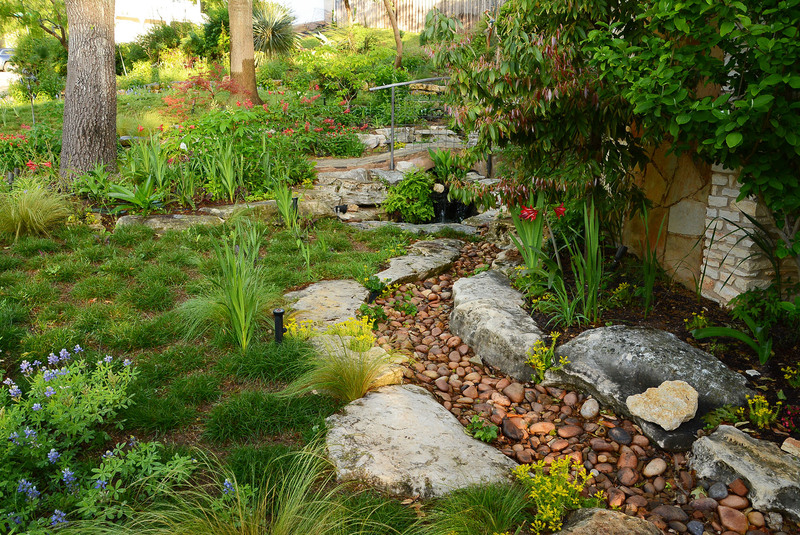 It’s also a good rain garden plant. 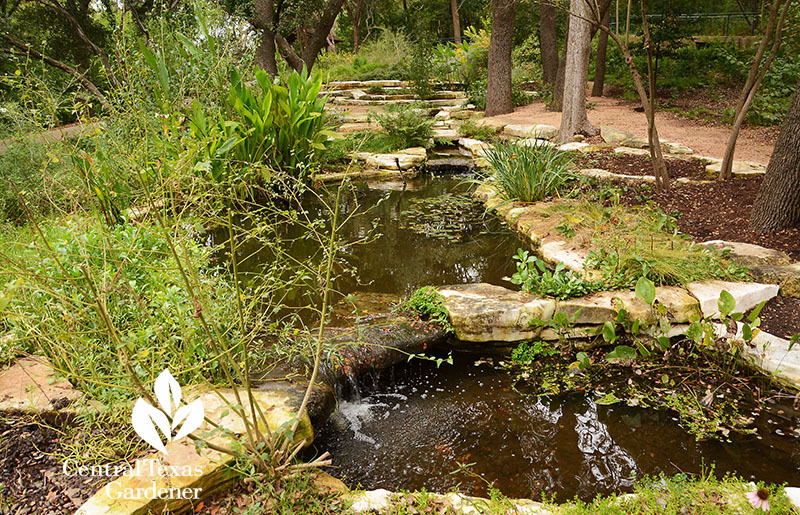 Much of the garden’s in shade—something many of us face in oak country—so David illustrates how to underplant with easy-going seasonal perennials and evergreens that evolve with the seasons. Heartleaf skullcap arrives in winter to cover chile pequin heading out until summer. 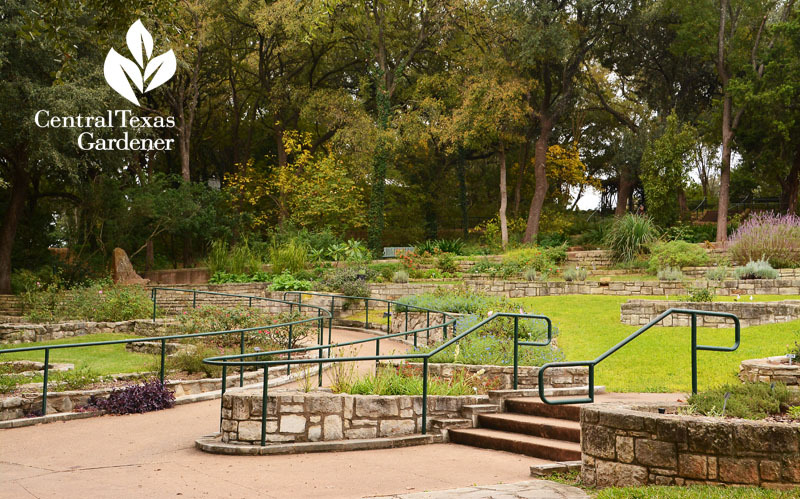 David took advantage of the sunny bank with plants from the aster and grass family. 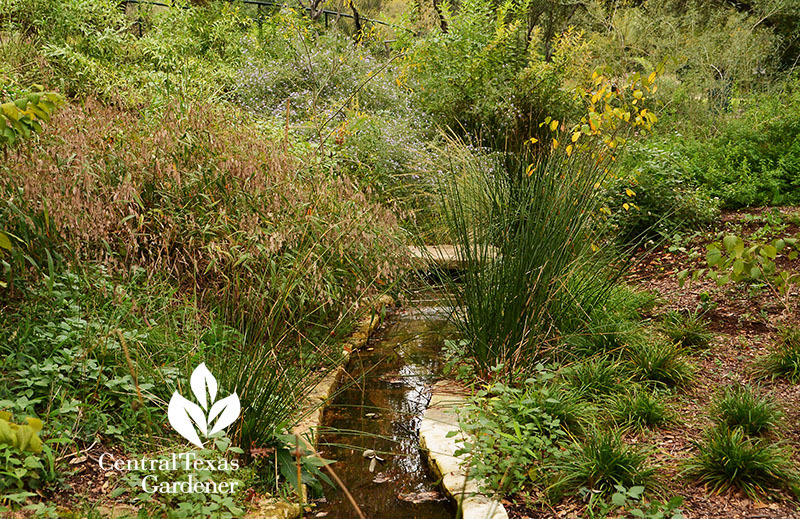 In a very small area, they planted over a hundred species—still growing in—that ensure visual and wildlife interest all year. An important lesson he teaches: they’ve planted for the future. 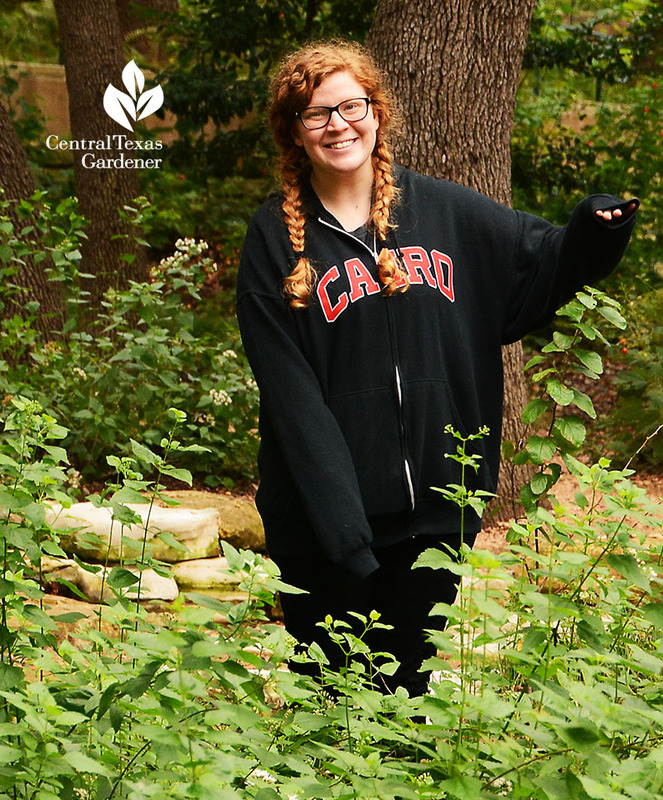 CTG’s audio/grip Katie Nelson did the yardstick act against a tiny Blanco crabapple that will soon tower her but reside comfortably as an understory tree under oaks. For now, native white mistflower’s almost as tall (but not for long)! Although they brought in soil and compost, they didn’t fertilize. 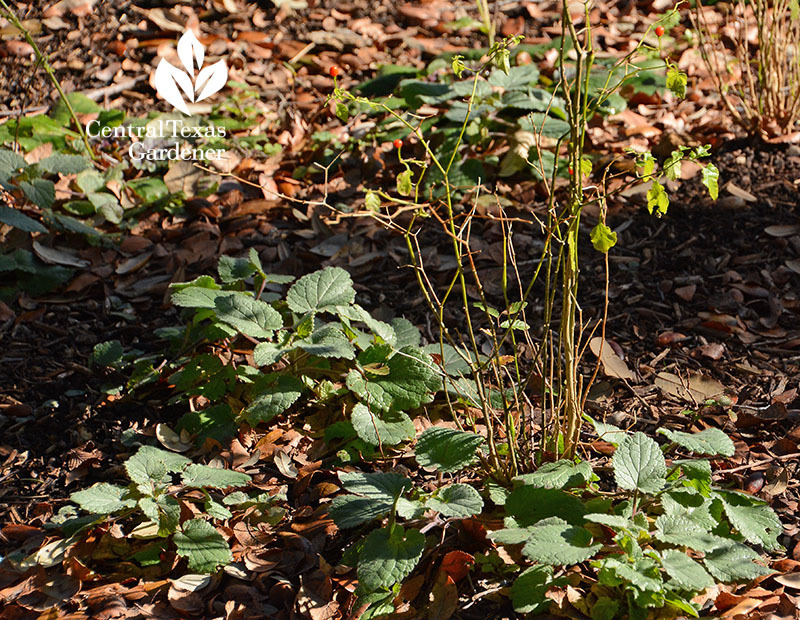 Another lesson: plant where the plant wants to be and let nature take it from there. Watch the whole story now!